Firstly, I’ll look at the different groups of institutional investors including insurance companies, defined benefit and defined contribution pension funds, private wealth management and sovereign wealth funds. The diagram below summarises very broadly how I see these groups and the extent to which their liabilities influence their investment strategy. As “Directed Trades” at an institution level, perhaps a macro-level hedge against falls in equity levels or interest rates, these might be against standard indices or volatility controlled indices. At an individual mandate level, in a strategy where options are inherent to the nature of the strategy, for example a strategy that attempts to monetize the premium between implied and realized volatility, a call-overwriting strategy or a tail hedge protection-buying strategy. At an individual mandate level, as one “axe” to represent macro views. Here the advantage of options include the convexity they introduce into the payoff of the trade, and alsothe ability to strictly limit the downside of a trade (ie in terms of premium spent) in a recent review of Diversified Growth Fund managers (who typically manage money on behalf of retail, defined contribution and smaller defined benefit funds) 13 out of 15 managers we met employed options in this way. 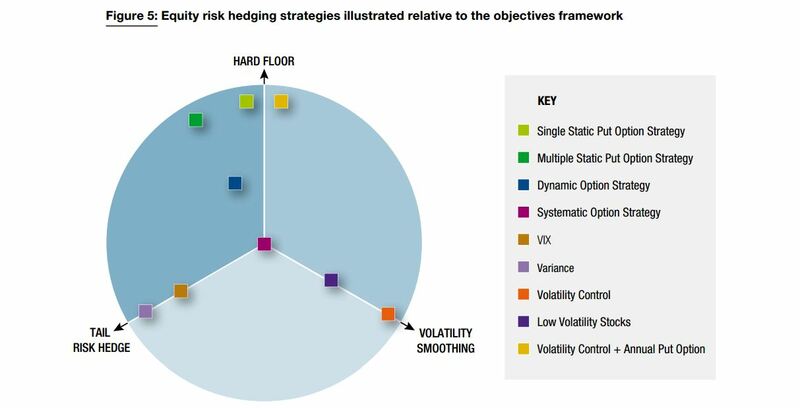 As a risk management tool, here the downside convexity and the ability to gain long volatility exposure can be particularly powerful, which gives the ability to use options as an risk overlay on much larger investment programs. I drew on material from this paper which I co-wrote, covering the sort of hedging structures pension funds have typically looked at, and how they might go about evaluating them.